The Life Is Beautiful festival is back for the fourth year in a row, taking over the Downtown area east of Las Vegas Boulevard with a hefty lineup of music, art, and guest speakers. But what really gets us excited, of course, is the food -- it's almost worth attending all three days just so you can try everything. Here's a look at the bites you should put at the top of your list. The Cosmopolitan's steak joint has a fun lounge atmosphere that will surely carry over to the festival. 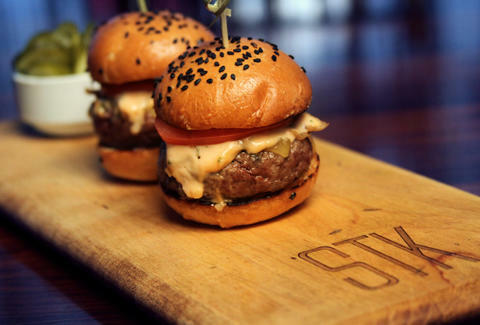 Keep your eyes peeled for the Lil' BRGs -- sliders that are kind of like a Big Mac (with "special sauce" on a sesame seed bun), but made with wagyu beef. The meat, a mixture of chuck and rib-eye, is 20-25% fat by design, adding up to a supremely juicy bite. One of the best things about Life Is Beautiful is the chance to check out some great food from out of town. BBD's is from Long Island, New York, and as the name suggests, its menu focuses on beer, burgers, and desserts. 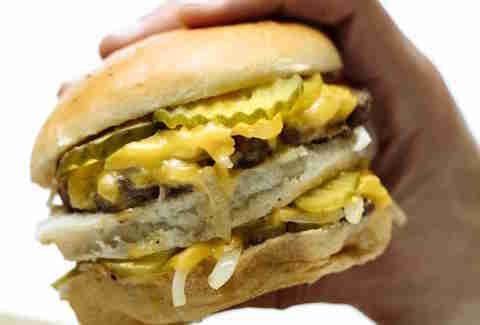 One of the dishes they'll be handing out is the Double Steamed Burger, a prime house-ground patty, steamed over chopped onions and pickles -- kinda like a White Castle burger, but with top-quality beef for a change. Fair warning: the employees here may take a break to watch Jane's Addiction, since the band's "Coming Down the Mountain" is actually on the playlist in the restaurant's dining room back home. One of the best coffee shops in Vegas will be handing out servings of its honey vanilla latte. The organic beans are a Italian Gran Crema espresso blend from Miscela D'Oro. 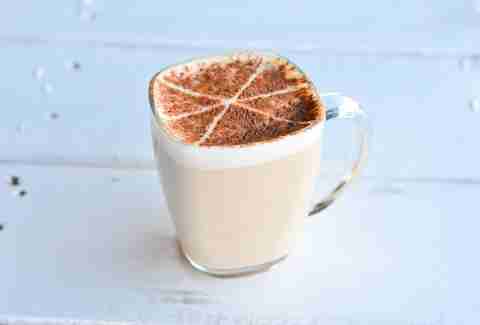 One shot of espresso is poured over diluted raw honey and steamed milk, then poured through powdered cinnamon to form a crust. It's finished off with a vanilla mist sprayed on top for an olfactory garnish. Just one of these buzzy drinks should help keep you awake for that midnight Major Lazer show. There will be a few food trucks on site as part of the culinary options at LIB. Check out Stripchezze for all kinds of cheesy snacks and sandwiches, and strongly consider the Daddy's On A Roll, which stuffs a mac & cheese blend of provolone, cheddar, and mozzarella inside a deep-fried eggroll. It's served with a side of "kimchi sauce" that actually doesn't have any kimchi in it, but is a sweet chili blend with a flavor that's half-Korean, half-American -- just as the owner of the food truck describes herself. "Cake Boss" Buddy Valastro is known best for desserts like cannolis and lobster tails (the pastry, not… yeah), but his Las Vegas restaurant at the Grand Canal Shops also serves up plenty of serious Italian food. His meatballs are among the best on the Strip, and are made with beef, veal, pork, marinara, and Parmesan, and come lightly smashed so they don't roll away. 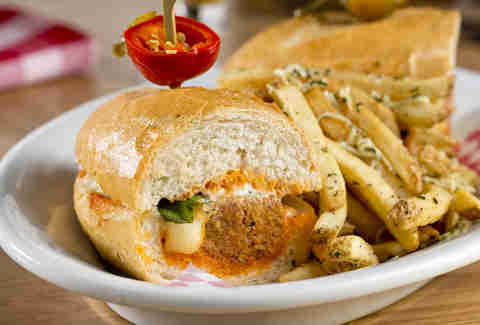 Try them out here at LIB, smothered with provolone cheese, herbed ricotta, and marinara inside a sub roll. The West Valley restaurant known for fresh farm-to-table fare will be serving a sandwich made with buttermilk fried chicken, slaw, and a mayo/mustard blend on a brioche bun. Don't worry about the calories... you'll be burning them off while power walking up and down LIB's 18 city blocks. So much better than its name implies, this salad is one of just a few dishes that have remained unchanged over the past 15 years at the Palms' N9NE Steakhouse. Just like the ingredients thrown into a bowl of minestrone soup, those in the Garbage Salad are greater than the sum of their parts. 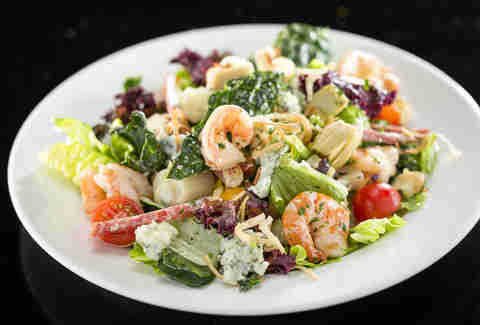 The mix of romaine, salami, shrimp, cucumber, tomato, artichokes, crispy shallots, olives, hearts of palm, imported gorgonzola cheese, and house-made dijon vinaigrette may seem like an odd mix, but they come together really beautifully in this dish. One of our favorite new restaurants in Las Vegas brings a healthy touch to French-inspired lunch and breakfast bites. The team offered a preview of their food last year at LIB, and will be back again. Don't skip the salmon club sandwich, served on whole grain bread that's toasted on-site. The salmon is wild-caught from the Atlantic Ocean and marinated for 24 hours in a mix of citrus, dill, and sea salt, then served with romaine lettuce, cherry tomatoes, and a dressing made with Greek yogurt and mint. It's a healthy and refreshing dish to enjoy while the sun beats down in the middle of the day -- preferably against a daytime DJ set from the likes of Black Lab or Aaron Jackson. What Are the Best Buffets in Vegas? We Ate at All of Them to Find Out. By combining Japanese and South American cuisine, SUSHISAMBA has proven to be a popular hit in the Grand Canal Shoppes at the Palazzo. LIB is the perfect opportunity to sample the Yellowtail Taquitos -- they're so popular, the restaurant says it's not unusual to serve up to 300 orders in a single day, but you can get access to them here. The Japanese yellowtail is finely cut and mixed with yuzu sauce and other flavors. It's then served inside a fried gyoza shell with pureed avocado on the bottom and radish sprouts on top. The result is a combination of sweet and tart flavors that's nearly addictive. 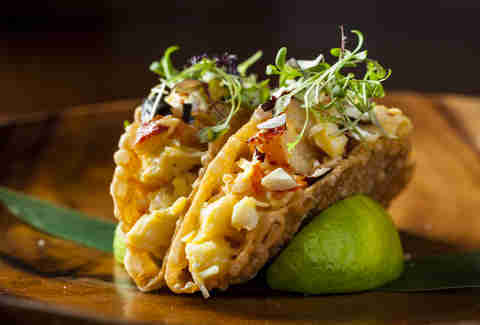 RM Seafood (and RX Boiler Room) from Chef Rick Moonen will be represented with a few fun snack dishes. 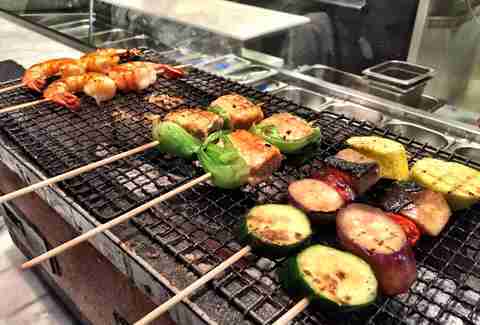 For something different, go with the Freakin' Vegan Vegetable Satay: flat bamboo skewers will be loaded with green zucchini, yellow squash, portobello mushroom, Japanese eggplant, and red shishito peppers that are grown on a farm just outside Las Vegas and chosen based on peak harvesting time. They will be marinated in a superfood vinaigrette that includes flaxseed oil and apple cider vinegar before being cooked on a Japanese robata grill and finished off with a kale topping. It's the best piece of evidence that you can eat healthy at an outdoor festival (and still eat food that's delicious). This food truck puts a fun fusion spin on Korean food. Witness the Dragon Fries, which come beer-battered with Korean beef brisket on top, along with Galbi Q sauce, cilantro, and nora komi furikake seasoning. The sauce itself blends a sweet barbecue flavor with a white cream, kinda like how an art exhibit called the Big Rig Jig blends two semi-trucks into one 50ft sculpture. You can find it at LIB in the courtyard of the old Ferguson motel. Was that a stretch? Maybe. What can we say, we're just really excited about LIB right now. Unlike most food trucks, 50 Shades of Green focuses on food that's clean, healthy, organic, and made without any sugar or artificial ingredients. You'll definitely want to try the turkey pesto panini, made up of roasted turkey, basil pesto, and havarti cheese on slices of Dave's Killer Bread. Then you can balance out all this clean eating by catching reggae band Dirty Heads. It's the best of both worlds. This cafe is popular for both breakfast and lunch, either at Downtown Summerlin or its original location near Las Vegas City Hall. 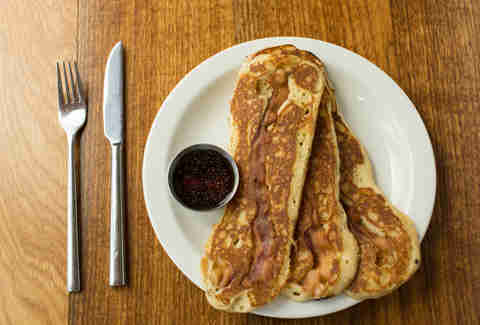 Stop by for the "bacon dippers" -- fluffy pancakes laid over strips of bacon served with peppercorn maple syrup for, yes, dipping. Might as well have a solid breakfast after the late-night Mumford and Sons show. This San Diego donut shop had big shoes to fill when it took over the Downtown space left behind after O Face Doughnuts shut down, but it's starting to draw loyal fans of its own. The business has a notable Simpsons fascination, with a themed bathroom and the Homer donut, which will be passed out at LIB. It's a fluffy creation topped with a cake batter glaze that's dyed pink and rainbow sprinkles -- just like a donut you'd see on the cartoon show. Donut Bar will also have maple bacon and vegan options at the festival, but we recommend sticking with the Homer. It's the kind of goofy treat you should consider bringing along to The Kindhouse, a new area this year that will be hosting stand-up comedy. 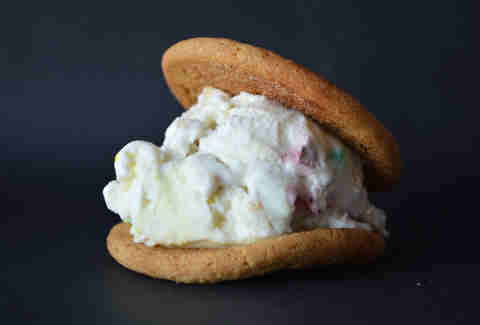 Coolhaus is all about fun and funky ice cream flavors and desserts. Based out of Culver City, CA, the restaurant is coming to Las Vegas with the specially created Life is Beautiful Sammie: a scoop of Whiskey Lucky Charms(!) ice cream smashed between two snickerdoodle cookies. And yes, it's everything you could imagine: Jameson Irish whiskey brings notes of orange blossom, sherry, honey, and vanilla, and real Lucky Charms cereal brings, you know, Lucky Charms cereal. Rob Kachelriess has been writing for Thrillist for nearly three years. He's still trying to figure out where to park at Life Is Beautiful. Follow him on Twitter @rkachelriess.